I was 1 month along when this was taken, surprise! It was twins. 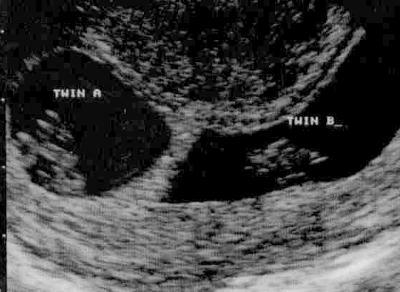 My HCG levels were high so we had a hint it may be twins, this was my 1st ultrasound and it was official. I am kind of freaking out because I thought I was 7 weeks pregnant last week and they did an ultrasound and found 1 sac with yolk but no embryo. DR think I might miscarry...Then yesterday I was in hospital with bad food poisoning and they did an ultrasound and found 2 sacs!! with yolks but no embryo. It is just a blank circle. Does anyone knows if it is possible at 7 weeks to see nothing? no embryo? just wanted to say I am an ultrasound tech and we can't see an actual baby at 4 weeks. So you were more like 6-7 weeks along. are these fraternal or mono/di???? Our ultrasounds look the same!! We found out on our 4th week, we too were completely surprised.I am 11 weeks now and go back tomorrow to hear their heart beats! Congrats on your babies!! Congrats..... Did you have any early symptoms? ?